Moore Place offers a warm, safe and friendly environment, with first class care home facilities to make you feel at home in our care. 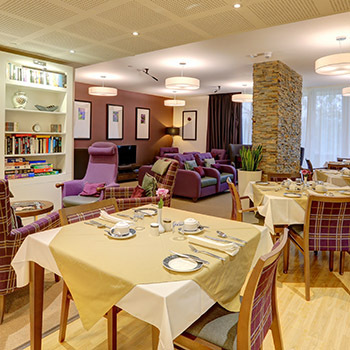 Built in Esher, Surrey, and well decorated with tasteful interior and modern design, Moore Place is a contemporary and elegant care home meticulously finished to an excellent standard. We know companionship is an essential part of life here at Moore Place. 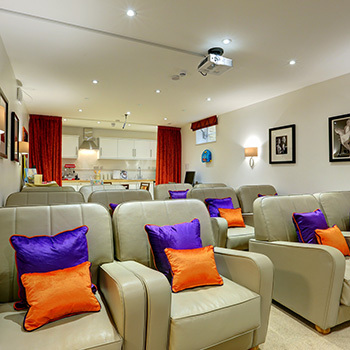 The cosy lounges, coffee lounge, activity room/cinema, and hair and beauty salon provide an array of luxurious spaces where people can mingle with neighbours, meet with loved ones, enjoy the free WIFI, watch films, read, chat or simply watch the world go by. On warm days residents can take in the peaceful setting overlooking the golf course and stroll in the home’s beautiful landscaped gardens, or simply enjoy a break at one of the comfortable outdoor seating areas. We have a greenhouse for those with green fingers, where you can turn your hand to a spot of light gardening. Find out more about our gardens at Moore Place here. Mealtimes are an extremely sociable and important part of daily life at Moore Place and with excellent dining rooms on every floor, residents don’t have far to go to enjoy wholesome, appetising, and freshly cooked meals. At Moore Place we know that our hobbies and interests are individual to us, they help to paint a picture of the way we like to live our lives and shape the person we are. We recognise that pets provide love, comfort and companionship, and pets are welcome to visit Moore Place at any time. We have quiet areas throughout the home, and our spacious en suite bedrooms mean you can enjoy peace and privacy whenever you want it. Personal space was an important consideration in the design of Moore Place. 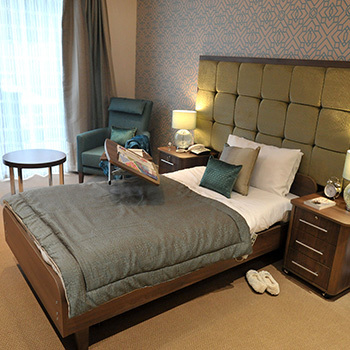 Our bright and spacious bedrooms have been designed to a very high standard and decorated to provide luxurious personal space where residents feel safe and happy. At Moore Place the fittings and fixtures in each room can be adjusted to individual resident’s needs, and all residents, enjoy the privacy of large modern, en suite bathrooms. Each bedroom has its own silent-running fridge, flat screen TV, Freeview, comfortable seating, and ample storage, including lockable drawers. We encourage all our residents to personalise their rooms however they like in order to make it home from home and reflect their individual style. Making the most of the beautiful setting, patio doors and large windows that lead onto garden floor patios enable our residents to enjoy the landscaped gardens of Moore Place from the comfort of their rooms. Our home is purpose built with care in mind and offers a wide range of features and facilities designed with the very latest technology and to Anchor’s exacting specifications. At Moore Place we offer supported living environments for older people with varying care needs. We offer assistance to older people who value their independence but require support with day to day activities such as help with personal care and medication management, as well as people living with Alzheimer’s and other forms of dementia. The range of assistive technologies we utilise are designed to maximise independence for all residents and enable carers to create a climate of freedom, dignity, choice and above all safety. The design of all the accommodation at Moore Place improves the standard of care by giving all residents, including those living with dementia, greater choice and dignity in their daily routine. A range of design features help residents familiarise themselves with their new home as well as create a safe environment as they go about their day-to-day activities. On each floor there is a communal dining room and lounge. 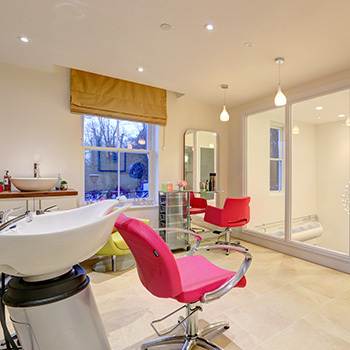 Housekeeping and laundry is included as well as top of the range spa bath facilities. Our spacious bedrooms are arranged along well lit, homely hallways that have been colour-coded and use signage that is both worded and pictorially illustrated, for easy recognition. Bedrooms combine all the comforts of home with carefully chosen assistive technology to provide an additional sense of security. Specially adapted lights, call systems and unique sensor strips enable our staff to immediately assist residents if needed, and help our residents feel safe at all times. Find out more about our approach to care at Moore Place here.